Kids carry the darndest biohazards in their personal affects, don’t they? 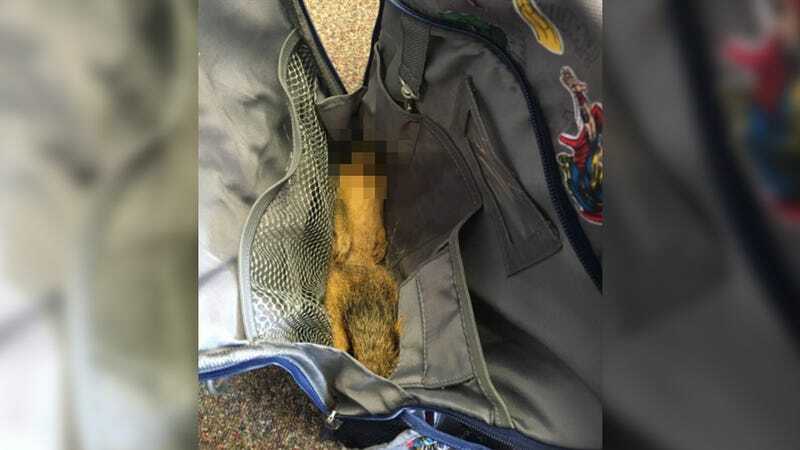 According to posts by Oklahoma mom Ladye Hobson on her Facebook page and blog Her View From Home, her son Brylan brought home what looks to be between one and one and half pounds of squirrel meat in his backpack. It all went viral, reported USA Parents, as mom and tot shared a laugh at the sqerel’s expense. I know what you’re thinking—squirrel dumplings would really hit the spot on an early fall night like tonight. But not so fast. The CDC recommends refrigerating raw meat immediately, at 40 degrees Fahrenheit (or below)—advice which Brylan seems to have ignored. “The principal proceeds to tell me, obviously holding back laughter, that the faculty has discovered a dead squirrel in my son’s backpack.” Glad someone finds improper refrigeration funny! Guess this mom isn’t losing any sleep over the fact that foodborne illness sickens and kills 3,000 Americans every year.